The new i-Series Plus integrated high-performance liquid chromatograph can be connected to the RID-10A differential refractive index detector. Since the column oven can accommodate a 30-cm column for use in sugar analysis (ligand exchange column), and the temperature can be controlled up to 85 °C, it therefore supports applications that require a long column and high column temperature. Here, we introduce an example of sugar analysis in juices using the Prominence-i with the RID-10A. Fig. 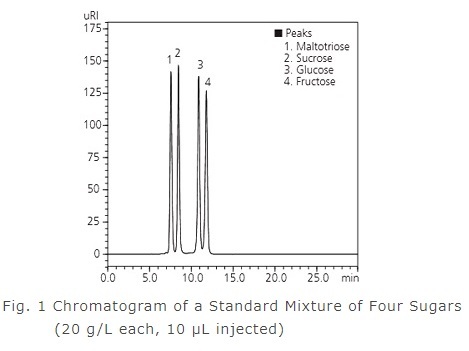 1 shows the results of analysis of a standard mixture of four sugars (maltotriose, sucrose, glucose, fructose) using a 10 μL injection (each at 20 g/L). For the analytical column, we used the Shim-pack SCR-101N, a specialized sugar-analysis column that supports both the gel filtration and ligand exchange modes. Fig. 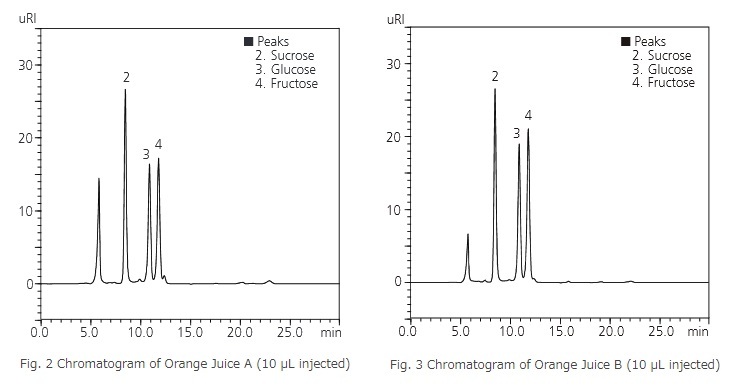 2 and 3 show the chromatograms obtained from analysis of Orange Juice A and Orange Juice B, respectively. Both Orange Juice A and B were diluted with water to obtain 10-fold dilutions, respectively, and after filtering the solutions through a 0.2 μm membrane filter, 10 μL each was injected. Sucrose, glucose and fructose were detected in both types of orange juice.